Everyone’s definition of a dream bedroom is different. 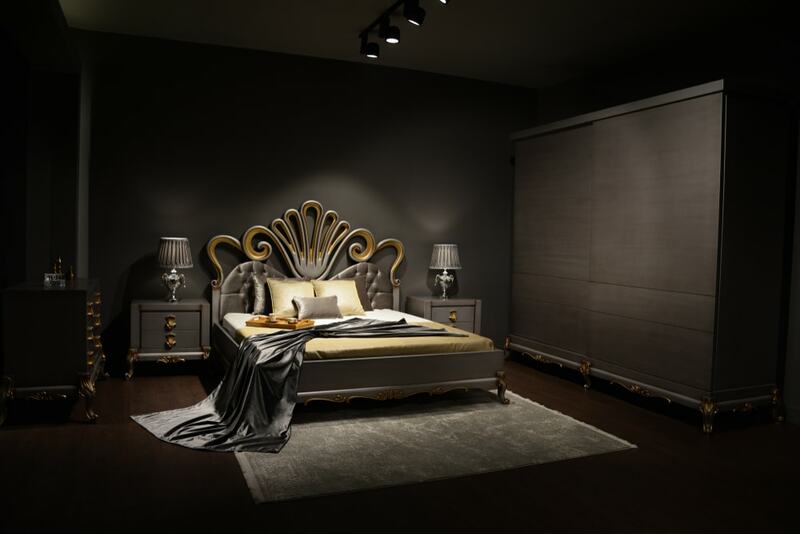 Even so, certain elements tend to be found more commonly than others when people try to imagine how their ideal bedroom should look like. 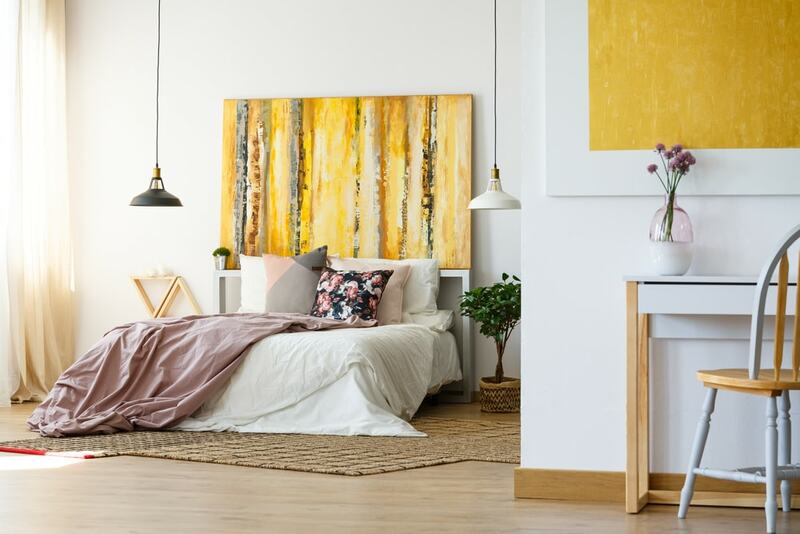 In this article, we’ll try to focus on these defining characteristics that any bedroom needs to be considered the ultimate place for relaxation and cozy sleep. Navigating through the world of interior decorations will easily turn into an overwhelming process for many people, so that’s why we need to get back to the basics and establish some fundamentals. Your bedroom represents your personal refuge so it’s understandable that certain decorating details are influenced by your particular tastes. 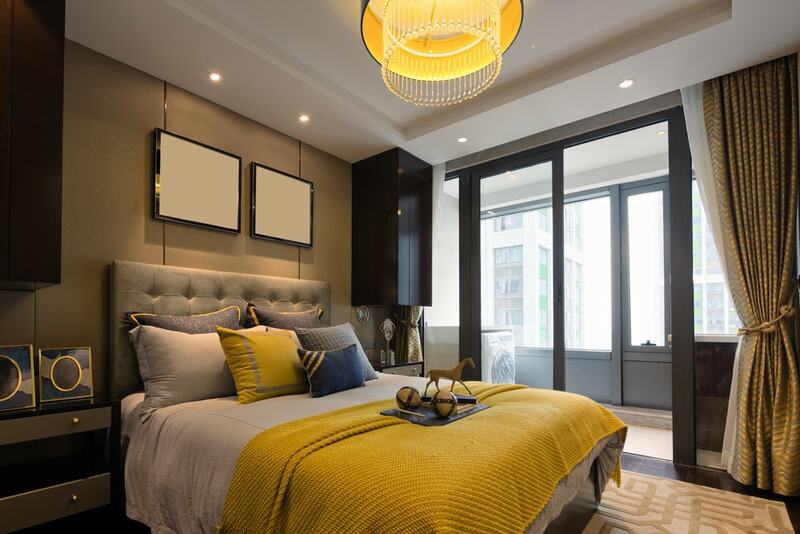 If you have a vague idea about the design of your dream bedroom, all that’s left to do is to find some great inspiration to bring your vision to reality. It’s time to explore the best ideas to help you make the best stylistic choices when designing and decorating this room. 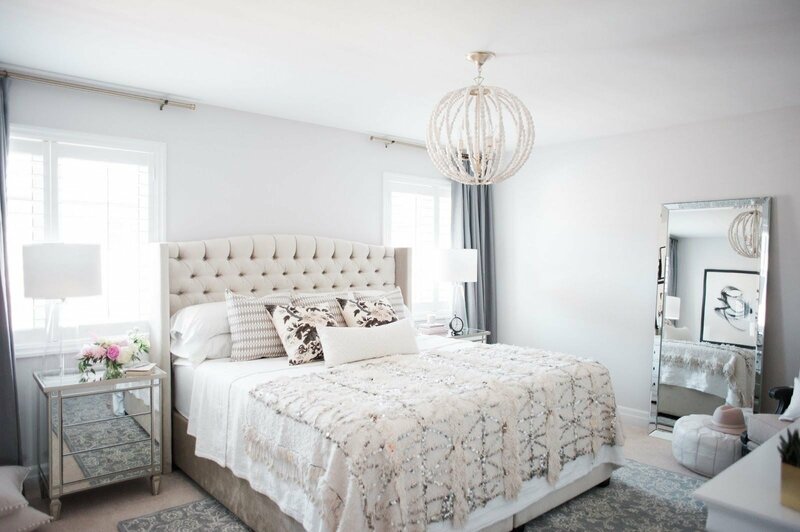 From large elements that are vital for the look of the bedroom to smaller details that play a role as well, everything in the bedroom matters. The bed is obviously a key element when it comes to creating your dream bedroom. 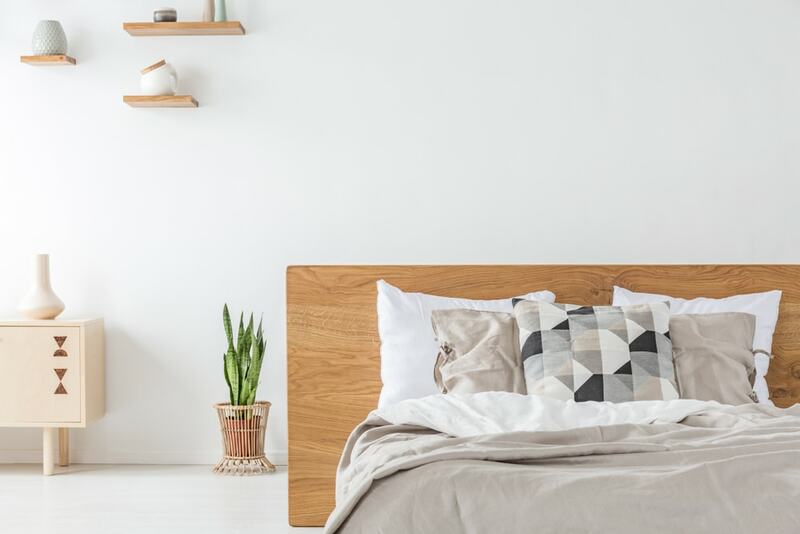 While you can make various compromises for other items and decorations in the room, it’s strongly recommended to spare no expense when it comes to the bed. Having a comfortable bed should be your top priority so that’s why you should consider getting a large king-sized bed where you can obtain some quality sleep. Choose a cushy and cozy mattress to ensure that your bed will always be your number one choice for relaxation. Pay attention to the bed frame and select some padded upholstering. Once you have the comfort aspect figured out, take a look at other details such as storage. Decide if you need some extra compartments aside from what’s already present in the room. Beds with integrated storage have become quite popular nowadays, so don’t leave them out of your options. While headboards aren’t always required, you shouldn’t miss out on the creative opportunities they provide. These elements aren’t just for having a comfy thing to lean on. You can use them to create a colorful design and continue the style of the bed upwards. 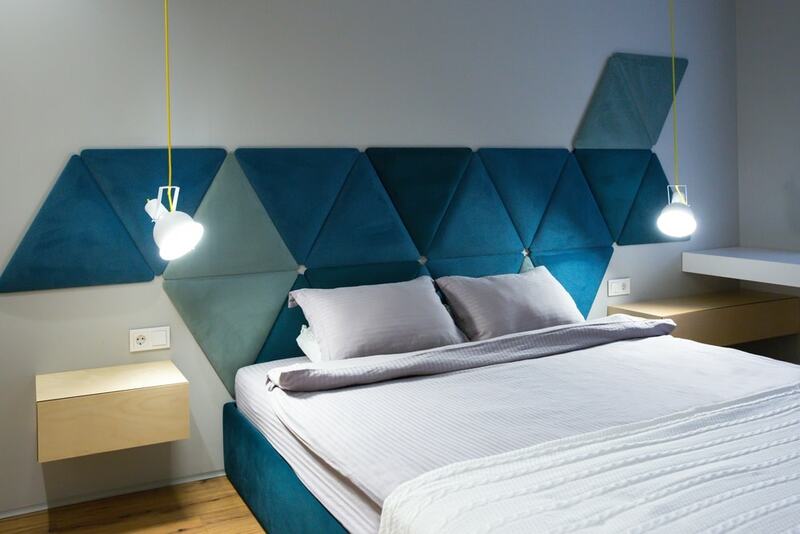 A more creative-looking headboard like this geometric model shown here will have a powerful impact in the bedroom in terms of overall aesthetics. Bedside tables are very useful to have in the bedroom. They’re reliable when it comes to storing various accessories and they seem to complete the look of the bed. While you can go for a traditional route and stick to a symmetrical look, it’s also important to take into account the needs of those who use the bed. Great bedside tables should be capable of reaching the best balance between beauty and functionality. It’s very likely that you and your partner have different needs, so bringing in a mismatched duo of bedside tables can be a good idea. We like this simple look where the bedside tables have different colors and accessories offering a more personalized visual impression. Aside from a different paint finish, you can also have bedside tables built from different materials. When it comes to filling up that empty wall space, the best solution is to invest in some floating shelves. They’re stylish to use anywhere given their small footprint and convenient storage options. You can display some meaningful decorations or place some useful objects within reach. There are some superb floating shelves you can purchase. Here’s our favorite model from Amazon. One of the most effective ways to dress up the walls of the bedroom is to paint it in a more vibrant color. Or you could try to get more creative and make an artistic effect like in this picture. 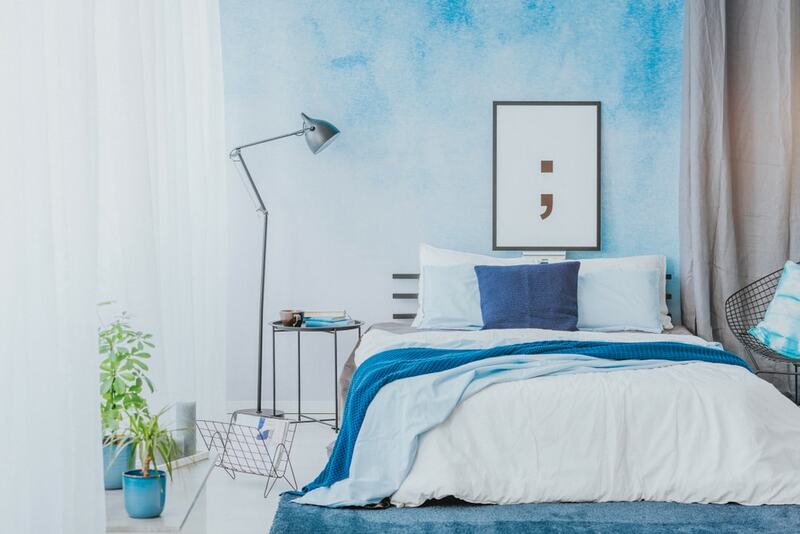 This blue bedroom creates a serene atmosphere thanks to many elements that form a cohesive look, including the touches of sky-blue paint on the wall. A simpler method to make the walls more beautiful is to add some wallpapers. Some stylish artwork that represents your personality could be also a good choice. Painting the wall can be too messy for many people, but anyone can find a piece of art they like and hang it on the wall. Creating a focal point instantaneously is thus entirely possible. An important part of the ambiance, the lighting in the bedroom shouldn’t be overlooked if you want to create a specific vibe for this space. 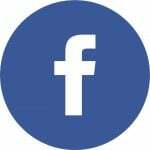 Some people prefer dim lighting like the atmospheric effect of Edison light bulbs while others like brighter lighting fixtures to see everything more clearly. Don’t limit yourself to just a central lighting source as you can enhance the ambiance through other lights. It’s all about finding out what works for you and which type of lighting gives you the best level of coziness. We recommend a flexible set of string lights to make your bedroom a more enchanting place. Take a look at these copper string lights from Amazon. In terms of bedding, there are lots of configurations you could try, but most people agree that the more layers you have, the better. A bed needs to feel rich and cozy, so be sure to include as many pillows as you need and some soft throw blankets. There’s no need to go overboard as not anyone needs to have a stuffy-looking bed to feel comfortable. Remember to stick to a matching color palette for the rest of the room’s décor. 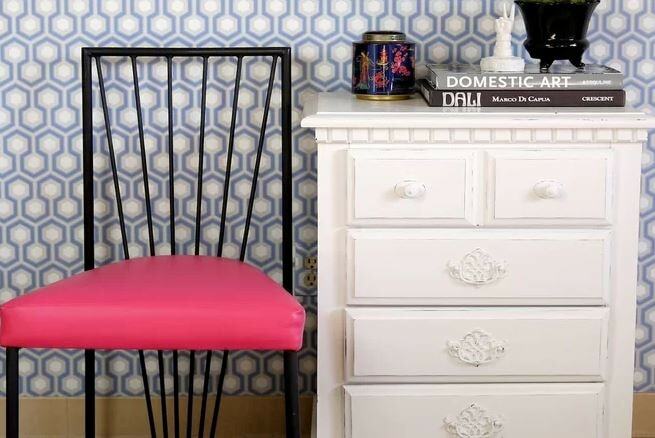 We also like the idea of mixing up patterns with solid colors to bring in some excitement. 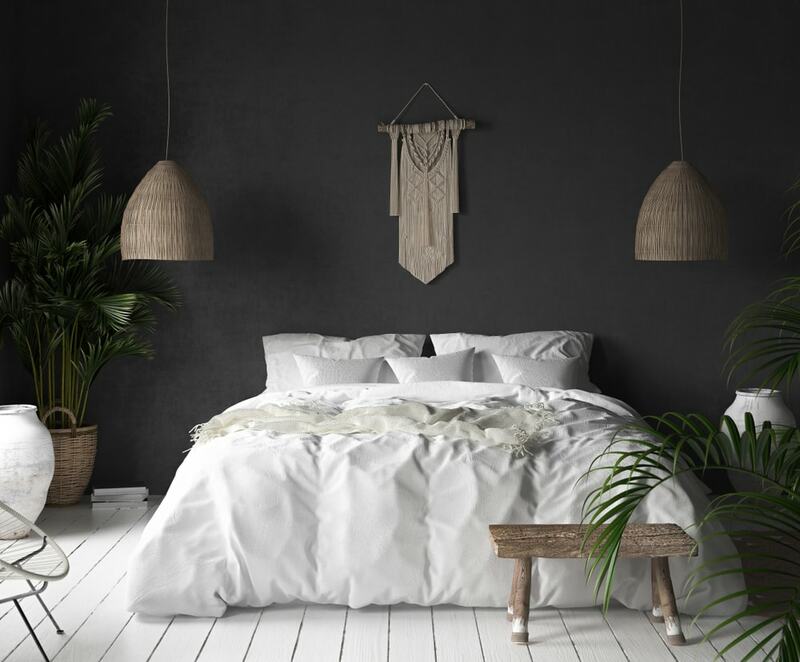 Select a fairly neutral duvet cover and work from there by putting your creativity to work. A good balance of comfort and style is provided by this quilted bedspread coverlet set from Amazon. When it comes to crafting your dream bedroom, the secret lies in the way you take care of little details. The rug represents a good example in that regard. This is an indispensable accessory to have as it grounds the room and extends the comfortable feeling of the bed to the floor. It feels great to wake up in the morning and plant your feet in a plush rug. You can either go for a small option or if your room can handle it, consider going for a brand new area rug which goes under the bed. We recommend a premium option like this luxuriously thick area rug from Amazon. 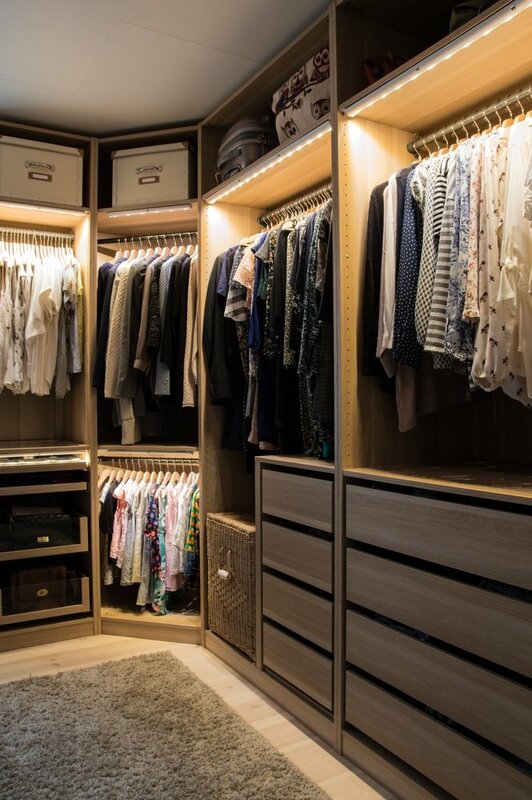 Ideally, any bedroom should have a walk-in closet to simplify the process of selecting an outfit with efficient organization and storage solutions. Those with space constraints will have to go with compact options like closet organizers. If you have the required space and you’re willing to invest some money, the walk-in closet is the way to go. Those with large wardrobe collections will probably love the opportunity created by walk-in closets to admire their items. It’s also easier in terms of keeping everything organized if you manage to incorporate this kind of closet. As an added bonus, the resale value of your home can climb upwards as well. Contrasting color schemes can look garish if they’re not done right, but if you pay attention to some details, this is not really a difficult look to pull off. For many people, having a bolder color palette in the bedroom can fit in with their ideal vision for this room. It’s just something about vibrant contrasts that instantly turn up the excitement and sophistication levels of a room. Interesting color contrasts don’t necessarily require exotic shades as you can use just black and white with the right colorful accents to create a memorable look. 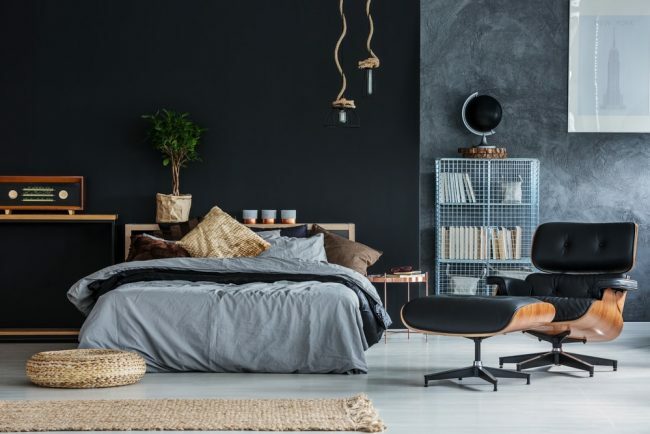 The stark contrast between the white bed and floor with the black wall offers an unforgettable first impression. Some boho-inspired elements and large floor plants maintain a more casual atmosphere for this elegant color combination. Some people’s idea of a dream bedroom includes a few personal touches that show off the uniqueness of the room. The most convenient and inexpensive way to customize the look of the bedroom is through the help of DIY projects. We like the idea of repurposed furniture. Take some basic items like wooden crates and, with a bit of polishing, you can turn them into rustic shelves in the bedroom. If you have a green thumb, it makes sense to include plants throughout the rooms in your home. One area that’s often neglected in that regard is the bedroom. A bit of green life can have a profound effect on the atmosphere of this space making it more lively and refreshing the air. 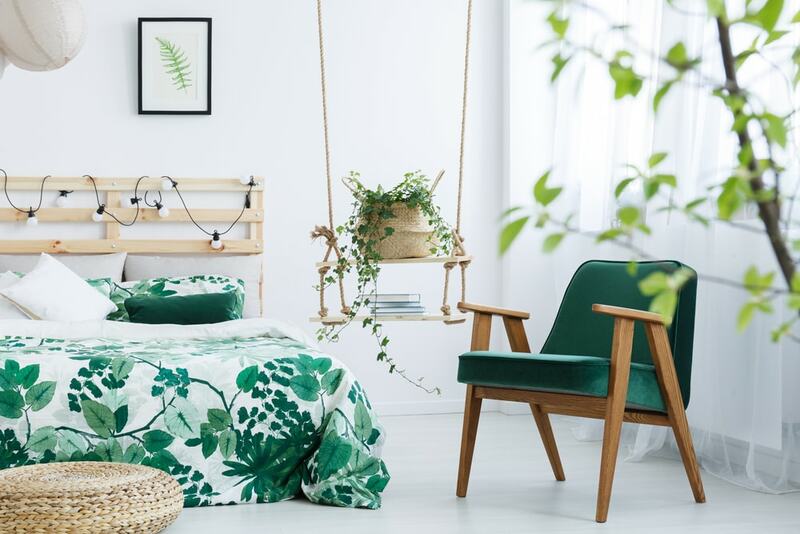 Houseplants can be incorporated in multiple ways, from basic potted plants and indoor trees to more creative solutions like this beautiful hanging plant. Patterns are fun to use when decorating, and the bedroom can represent a perfect space where you can play with them to your heart’s content. From blending patterns on throw pillows, bedding, walls, or other accessories, the possibilities are virtually endless. The only thing you have to worry about is to keep a visual balance and pair matching color shades to avoid chaotic looks. There’s something very peaceful about a neutral color scheme. That’s probably the main reason why many people opt for neutral tones when creating their dream bedroom. Whites and tans have some lovely qualities when used together. 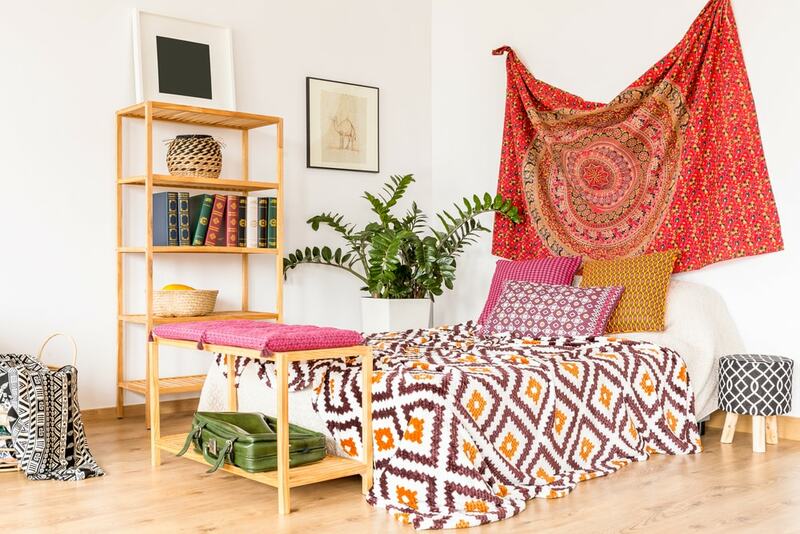 Add plenty of natural sunlight and you can be happy with your bedroom look without too much effort. Sometimes a simple approach works best. Whether it’s a wall art or a table lamp, little decorative elements complete the overall atmosphere of the room. Plants can be used in this way or you can incorporate some simple glass vases by themselves. The good news about this is that you can always refresh the look periodically by swapping out the decorative accents with others. Alarm clocks on nightstands are very useful and they can double as décor pieces. Instead of selecting a modern-looking model, we recommend a stylish wooden alarm clock which should look great on any nightstand. Check out this model on Amazon. The bulk of your wardrobe is usually handled by a walk-in closet, but sometimes it doesn’t hurt to have some extra storage room. A small dresser represents a nice solution in that case as it also provides a good opportunity to incorporate a new stylish element into the bedroom. Your bedroom essentials can be neatly tucked away while at the same time you gain a solid surface to place books or other decorations. Whether it’s gold or silver accents, adding some metallic shine to the bedroom can be a smart idea when used in small doses. Sparkly and shiny elements can easily become tacky, but it seems that this bedroom finds the right balance to create a tasteful look. Consider sticking to just a few decorative items like a silver frame for the mirror or sequins on the bedspread. If you’re not a fan of headboards and look to embellish the wall in a unique manner, why not create a gallery wall? 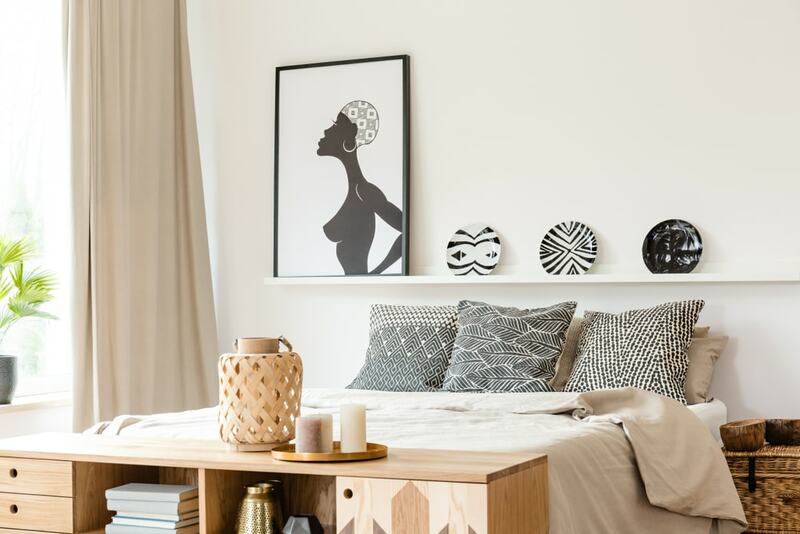 Take your favorite pieces of artwork or photographs and make a stylish arrangement for a personalized bedroom. Make sure you plan how the wall of frames will look like beforehand to avoid any mistakes.